Kitchen Flavors , Divya M , Ramya ,G.Pavani ,Yasmeen thinks I am a Chocoholic person and she is right also. 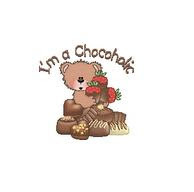 So they honored me with I'm a Chocoholic award. Thanks a lot. Thanks a ton sireesha for this cute award...I really love chocolates!